The University of California Press has just published Asylum Denied: A Refugee’s Struggle for Safety in America, by David Ngaruri Kenney, a former client of the Center for Applied Legal Studies (Georgetown’s political asylum clinic) and his lawyer, Georgetown University Law Professor Philip G. Schrag, the clinic’s director. The book explores U.S.immigration law and its administration (particularly but not exclusively) asylum adjudication, through Kenney’s first-person narration of his Kafkaesque encounters with the entire panoply of American immigration bureaucracies and courts. Kenney was a poor farmer in Kenya who led a boycott to protest certain agricultural policies of the country’s strongman President, Daniel arap Moi. For this act of defiance, Kenney was nearly executed, tortured, and imprisoned. After an amazing escape to the United States, he applied for asylum, but his application was rejected at every level, and he was finally forced to return to Africa, where he was once again nearly murdered. America where he was plunged into an incomprehensible and hostile immigration system. Kenney and Schrag's dealings with the Department of Homeland Security and federal immigration courts reveal a system that is "disquietingly random." Applicants are victims of "refugee roulette," their fates largely dependent on the sympathies of the government officials who hear their cases. Schrag's recommendations to make the system more consistent and compassionate give the book-and Kenney's heartbreaking story-an added sense of purpose and real practical potential. Kenya's recent political implosion lends this book added topical relevance, but its core concerns for justice and reform remain directed at American society, especially (though not only) its byzantine asylum system. The book is available in book stores and on Amazon.com. My interest Jim’s book stems from the fact that as part of teaching Civil Procedure, I teach the 7th Amendment and have always found it a peculiar area of law. The Court has held that “preserved” as it is used in the 7th Amendment means that in order to determine whether you have a right to a jury to day, you must look to history. Interestingly, the history that the Court purports to be interested in is English practice as opposed to the purposes of the 7th Amendment as a matter of U.S. history. A focus on historical purposes rather than English practice would significantly alter the Court’s approach and could change the result in some cases. For example, Paul Carrington has argued that at least one purpose of the 7th Amendment was to constrain life tenured federal judges. See Paul Carrington, The Seventh Amendment: Some Bicentential Reflections, 1990 U. Chi. Legal Forum 33. If one accepted this as a core purpose then the Court’s analysis in Cooper Indus. v. Leatherman Tool Group, 532 U.S. 424 (2001) might have been different. In that case, the Court had to decide whether it violated the reexamination clause for a court to override a jury determination on punitive damages. The Court’s analysis seems to divide the world into questions of fact that are for juries and questions of law that are for judges. According to the Court, punitive damages are “an expression of . . . moral condemnation” rather than a determination of fact and therefore belong with judges. Of course, one might also just have well have said that “moral condemnations” are not matters of law either. If the Court’s core understanding were that the purpose of juries is to constrain elite life tenured judges then “moral condemnations” might be just the sort of thing that belong with juries and not with elite judges. The historical test presents major complications where the cause of action is one that did not exist in 18th century England. Here the Court looks for historical “analogies.” So, in a suit against a union for breach of its duty of fair representation, a lot of ink was spilled trying to determine whether such a suit is more like a suit to set aside an arbitration award (since the underlying complaint had to do with the handling of a grievance procedure), or like a suit against a trustee for breach of a fiduciary obligation (also an action in equity), or like a claim for professional malpractice which was an action at law. See Chauffeurs Local, 391 v. Terry, 494 U.S. 558 (1990). None of the analogies is very convincing and the whole exercise is rather like trying to decide in which room of Monticello Thomas Jefferson would have put his TV. Historical analogies present almost insurmountable problems. However, even where the clause of action did exist in 18th century England the historical test presents challenges, complicated by the fact that we now have a unified system (rather than separate courts of law and equity) as well as a number of new different procedural mechanisms. This is where Jim’s book comes in. He takes the Court at its word that it is interested in knowing the truth about 18th century English practice and sets about to determine what that was. The result is a book that is quite a fascinating exploration of English jury trial practice. I am not a historian, but it seems to me that Jim demonstrates pretty convincingly that when the ct tries to figure out 18th century English practice, it frequently gets it wrong. For example, in Markman, 517 U.S. 370 (1996), the issue was whether the interpretation of a word in a patent claim (the meaning of “inventory”) is a question for the judge or the jury. Jim argues that contrary to Souter’s assertion, that this type of case was not rare and that interpretation of disputed patent instruments was an issue for the jury. I think he makes a pretty persuasive case that the ct gets the history wrong. In addition to examining the question of when there is a right to a jury in the first instance, Jim’s book also examines historical practice with respect to the reexamination of jury verdicts, which relates to the second clause of the 7th Amendment. The book highlights some important features about English practice concerning reexamination of jury verdicts. For example, the modern practice of judgment as a matter of law was not well established, directed verdicts functioned quite differently than they do today, and issues concerning damages, including punitive damages, were sent to juries and the mechanism to respond to excessive awards was to grant a new trial. As Jim’s book notes, the Court has been far less wedded to a strict historic approach with respect to the reexamination clause. The result is that on the one hand, the Court has been quite expansive in finding a right to a jury as an initial matter, but also more expansive in supplementing juries through directed verdict and in over riding jury verdicts. The final point concerns the composition of juries. 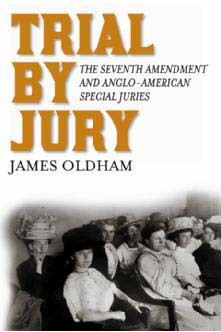 Jim’s book details the very interesting history concerning the use of specialized juries, including juries of matrons and other special juries. The composition of juries is not something the Court has pegged to historical practice. Modern requirements that juries reflect a reasonable cross-section and be selected in a non-discriminatory way, reflect values outside the 7th Amendment and indeed may reflect values that go beyond the fairness of the trial and instead may reflect concerns about inclusiveness in civil society. But Jim makes the point that to the extent there is interest in experimenting with special juries composed of particular types of experts or even people with particular education levels – that would not appear to violate the 7th Amendment (at least to the extent it is understood as historically based). Let me just say a word about the complexity exception. Jim explains that in many complex cases, the matter was referred to special masters or to commercial arbitration. It strikes me that there are two ways to look at this history. On the one had, it seems to support the proposition that frequently complex cases were not decided by common juries. But, if I understand the history, one could also say that complex cases were frequently not decided by judges. When people talk about a complexity exception, they frequently mean that in complex cases, the case might not be decided by a jury but instead by a judge. But I am no sure that the history supports that so much as the idea that complex cases might be decided by special juries. A final thought: in Chauffeurs Local v. Terry, the Court considered the question of whether there was a right to a jury trial in a suit against a union for breach of its duty of fair representation. The opinion produced long opinions examining 18th century practice concerning suits against a trust fiduciary and suits for malpractice. Justice Brennan filed in concurrence in which he wrote: “to be sure, it is neither unusual nor embarrassing for members of the Court to disagree and disagree vehemently. But it better behooves judges to disagree within the province of judicial expertise.” He suggested cutting back somewhat on the historical test. Justice Brennan was metaphorically hooted down by the rest of the Court in this suggestion. It is clear to me after reading this book that if the Court is going to continue to do this historical test, that they really have no choice but to officially appoint Jim as the federal court special master on 18th century English practice and refer to him these historical questions. Trial by jury in the United States, however controversial in application, remains a treasured part of most citizens’ concept of liberty. Everyone is familiar with the safeguards that trial by jury supplies to criminal defendants. Nearly everyone knows that the right to a jury trial also applies to civil cases, although it can be waived. The source of the right in civil cases in federal courts is the Seventh Amendment, and in state courts the right is preserved by comparable provisions of state constitutions. The Seventh Amendment provides that in suits at common law involving more than twenty dollars, the right to jury trial shall be preserved. This seems simple and straightforward, but what does it mean? What right to jury trial? What did the framers have in mind by their simple formulation? The rule thus fashioned by the Supreme Court came to be called “the historical test.” A commonly-quoted, succinct version of the test is the following 1935 formulation in the case of Dimick v. Scheidt: “In order to ascertain the scope and meaning of the Seventh Amendment, resort must be had to the appropriate rules of the common law established at the time of the adoption of that constitutional provision in 1791.” This test survives to the present day, despite unrelenting criticism, mainly from legal academics. In the past decade, the Supreme Court had several opportunities to revisit the historical test for the scope of the Seventh Amendment right to jury trial. In 1996 in Markman v. Westview Instruments, Inc., the Court emphatically declined the opportunity, unanimously reaffirming the historical test. In Trial by Jury, I do not try to revisit the argument that the Court should discard the historical test; rather, I take that test as a given and then measure its scope by examining actual trial practices in England in the late 18th century, especially as revealed by archival sources. This leads me to conclude that the Court in Markman improperly withdrew the construction of patent claims from the jury. Yet at the same time, I claim that a complexity exception to the Seventh Amendment guarantee would be legitimate under the historical test. Who were the “peers” in the so-called “jury of peers”? According to Henry Toulmin, United States Judge for the Mississippi Territory and author of an 1807 book called The Magistrate’s Assistant, “The fundamental principle of this institution [trial by jury] is, that a man should be tried by his peers or equals, a commoner by commoners and a nobleman by nobles.” This proposition, however, is, and for the most part always has been, a fairy tale. Historically, we boasted about juries of our peers while excluding half the population--women--from any jury service other than the rare, single-purpose jury of matrons. We also followed practices that kept racial and other minorities off juries or that left them drastically under represented. In the not so distant past, the United States also maintained requirements of property ownership that excluded the poorest segments of the economic spectrum of society. Both the jury of peers concept and the reasonable cross-section requirement relate to jury composition procedures. They do so, however, with sharply different objectives. As Judge Toulmin suggested, the jury of peers notion is aimed at giving the defendant a fair trial by placing on his jury at least a representative number of people that share the defendant’s cultural, linguistic, ethnic, or possibly socioeconomic circumstances. The reasonable cross-section requirement, by contrast, is designed to ensure that members of all significant, or “cognizable,” segments of the community have the opportunity to be jurors. This egalitarian requirement pulls strongly against any procedure or tradition that would permit the formation of juries from lists of persons with special qualifications. The idea of drawing exclusive special juries from specialized lists seems to be anachronistic today. Elite special juries surely are antithetical to the hard-fought, long-delayed goal of opening up jury service to everyone. Having eliminated the unsavory exclusions of the past, how can there remain a place in modern American society for an exclusive special jury? I argue that there is still such a place--that our history justifies continued experimentation with jury composition, including the special jury. However desirable the reasonable cross-section requirement is as a means of keeping an increasingly stratified people personally involved in the business of democracy, the requirement contributes little or nothing to other goals, such as coping effectively with jury trial of complex cases, or striving for fairness to litigating parties. Jim Oldham, the preeminent authority on Lord Mansfield, is fast becoming the preeminent authority on the history of the civil jury. His new book, Trial By Jury, is an indispensable contribution to that important field. I wanted to say a few words about Jim’s chapter on the Complexity Exception to the right to a jury trial. The Supreme Court has never ruled on whether such an exception exists, and apart from a Third Circuit decision in 1980, it has rarely been successfully invoked in the federal courts. As a result, juries today hear cases of enormous economic and scientific complexity in areas ranging from antitrust to toxic torts. Because the Supreme Court has adhered to the historical test for the scope of the Seventh Amendment, many observers see us stuck with an outdated system that uses overburdened juries. Jim dismantles this argument. Writing with characteristic elegance and insight, he goes beyond Lord Devlin’s well known arguments, and demonstrates more strongly than Devlin ever did that if we look at the actual practice in England in 1791 the complexity exception can be justified. Jim points out that in the late eighteenth century numerous cases in England were decided by arbitrators with specialized knowledge, not by juries. Jim couples this with the undisputed fact that the English at this time also used special merchant juries as well as other special juries for many complex cases, a practice that has faded away in this country. In sum, if we actually adhered to the historical practice approach, juries would be relieved of many complex cases today. Jim’s book got me thinking about an analogous issue that is much-discussed today. If you ask a modern lawyer about the problem of juries grappling with complex matters, he is likely to say that at least the Daubert decision removes some of those problems. Daubert, as you know, gave the trial judge a gatekeeper function so that he could keep from the jury expert witnesses who were too far out of the mainstream, that is, who were not using reliable scientific methodologies. But Jim’s insights lead us to look more closely at that assertion. Think about it. If a judge finds that an expert, offering (for example) a novel theory about whether a product is toxic, is indeed reliable, the case goes to the jury where it will be confronted with a true nightmare of complexity: the much-feared battle of the experts, which the jury will have to somehow sort out. And what is a judge doing when he keeps an expert off the stand? The judge is either deciding that the testimony is not reliable, a question that is supposed to involve looking at the presence or absence of peer reviewed publications and other factors that are not themselves necessarily complex. Moreover, as Mike Gottesman has argued in an important article, in some cases the judge in a Daubert hearing may not be able to penetrate the expert’s work, but he keeps the expert off the stand because the judge has decided that the expert is a charlatan, the very sort of classic demeanor-style question that juries are supposed to resolve. So I’m indebted to Jim for sharpening my thinking in this field, and we are all indebted to him for his outstanding work in this book. This all-woman jury sat on November 2, 1911 to try A.A. King, editor of the Watts News, for having published indecent and obscene language in an issue of his newspaper. According to an article in the Los Angeles Times on November 3, King had printed, verbatim, “hard epithets” used about him by a City Councilman. King testified that he wanted the people of Los Angeles to know what kind of a man the councilman was. The jury clearly approved, deliberating only twenty minutes before returning an acquittal. Women’s suffrage was granted in California by constitutional amendment in October 1911, and in the month following over 80,000 women in Los Angeles registered to vote. See Rebecca J. Mead, How the Vote Was Won: Women Suffrage in the Western United States, 1868-1914 (New York and London: New York University Press, 2004): 148. Court officials responsible for impaneling juries evidently assumed that eligibility for jury service accompanied the right to vote. For A.A. King’s trial, the Deputy Constable summoned 36 women for jury duty. All 36 appeared, and 12 were chosen (their names appear in the Los Angeles Times article, as does a description of the voir dire). On April 25, 1912, however, the District Attorney of Sacramento County issued an opinion letter pointing out that all references in the California Code to jurors were to men, and that since “the constitutional guaranty of the right to trial by jury is everywhere recognized as only the right to a jury as it existed at common law; that the legislature would have to change the law expressly if it were intended that women be eligible for jury duty.” In 1917, the California legislature amended the law to make women’s jury eligibility official. See Leland Stanford, “Early Women Jurors in San Diego,” The Journal of San Diego History 11 (April 1965): 16.